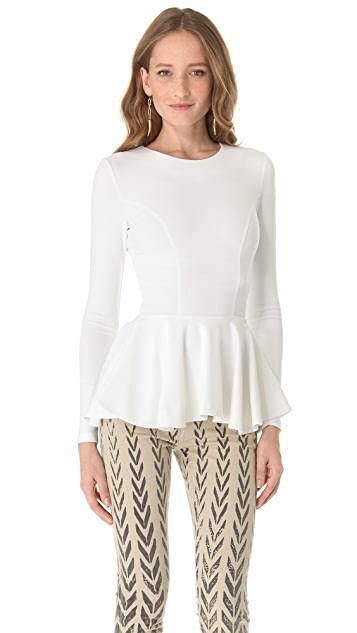 A flirty peplum flares from the waist of this curve-conforming jersey top, adding a feminine twist to a simple silhouette. Hidden back zip. Great quality of fabric, fit and flare. You get what you paid for! I'm usually and xs but got a small due to the reviews and it was perfect. White is definitely the color this season. No regrets on purchasing this one! I have a smaller waist so most peplum tops don't fit as precisely, though this top fits to a tee. That being said, I find it to be a tad smaller in size than most tops. But I'm happy to have found a peplum top that actually fits! The weight of this fabric is heavier, but that just adds to lovely way the peplum flows. It is still slightly see-through though. There is a fold at the neck that is visible when worn and when I tried it on with a light grey bra, you could slightly see the colouring through the shirt. It's to be expected though with any white top. All in all, I am very happy with this top. 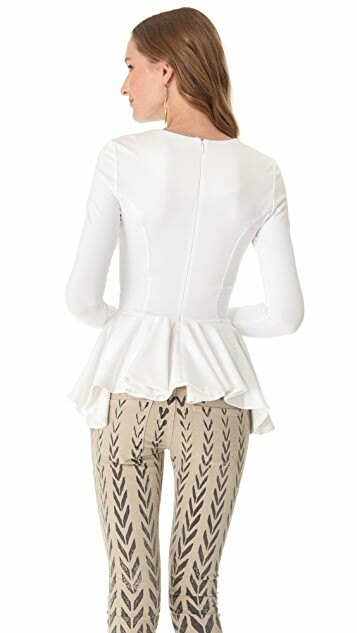 The peplum frills are uneven and gorgeous when you put it on. LOVE! this top was too short and too tight although i ordered a L. mostly i wear size M. it made me look very heavy in the waist although i'm thin! quality was good, but very thick and heavy. didn't work for me. this is such a beautiful top! most of the peplum tops don't look that great to me, nor do they look good on me. i'm 5'10 and every time i tried one on the waist was too high. not this one, it fits absolutely perfect and the fabric is also beautiful! quite heavy and it feels a lot more expensive than it costs. i agree with the previous reviewer it feels like it was made for me. i'm a size 4 and got the black in a xsmall instead of a small, because i have a very small waist. It is a gorgios top. When I took it on I had a feeling that Torn by Ronny Kobo is my personal sewing company - it is right on my figure. Super super super! I am in love with it!